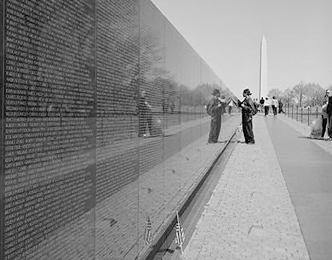 The Vietnam Memorial is a major stop along our National Mall Tour. In America we call it the Vietnam War, but did you know that in Vietnam they call it the American War? A long swath, a dark scar in the Earth, this memorial is a highly emotional visit symbolic of a time many will never forget. Feel the pain of war as you touch your hand to the immortalized name of a soldier who gave the ultimate sacrifice for his country. Learn the stories of what happened overseas and how the memorial came to be - take time to reflect.